NEW! Try the Most Comprehensive System Sizer In the Industry To Date, With Over 6000 3D and DWG Drawings! All Available in Revit! If you already know your total system GPM, you may skip this and enter your demand in the total system GPM box below. If you already know your total fixture unit count, you may enter it in the FU’s fixture unit’s box. If you do not know your total GPM or FU’s, please click calculate. Click to add redundancy to the system. Selecting this option adds one extra pump to the skid. In the event one pump fails, the skid is still capable of providing 100% of design capacity. This will not affect total system GPM or manifold size. Header Size ("inches") A - 2-1/2" B - 3" C - 4" D - 6" E - 8" F - 10" G - 12" H - 14"
Enter discharge pressure here. If unknown, click "calculate" above. Using the pump performance curves below please select a pump that meets your per pump performance critera. A good pump selection should be as far right on the curve as possible. 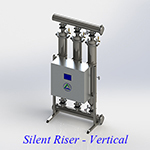 The ultra-quiet Silent Riser is the most versatile, sustainable, user-friendly packaged booster system on the market today. With an unbelievably small footprint and endless mounting configurations, there’s virtually no place it can’t go! The Silent Riser is maintenance free - media cooled, insulated and lubricated; these pumps are built to stand the test of time. 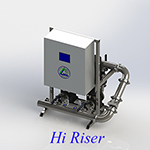 Additionally, Silent Riser contains no petroleum products or mechanical seals, thus eliminating the need for annual and semi-annual pump preventive maintenance. 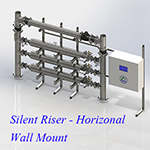 When you need unmatched performance and reliability, look no further than the High Riser! 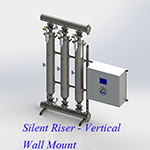 The work horse of the industry, the High Riser is the ideal choice for the most demanding pressure boosting applications. Utilizing a stainless steel multi-stage pump with easy to replace cartridge type mechanical seals, downtime and maintenance costs are drastically reduced. System headaches become a thing of the past. 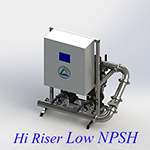 A highly reliable and versatile system, the High Riser’s wide range of customizable pump options also make it the right choice for high temperature, low NPSH, break tank, suction lift, boiler feed or aggressive-media applications. When it comes to performance and reliability, only one system rises above the rest! Mini Mi may be EZ Flo’s baby brother, but there’s no sibling rivalry here! 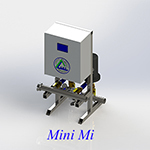 Mini Mi offers all of AMT’s high quality features in a small, quick-ship package. With flows to 120 GPM, heads to 140 feet and a footprint of only 26” x 26”, Mini Mi is ideal for residential/light-commercial applications. Each system utilizes micro-variable speed drives for high efficiency and a monochrome touch screen for ease of use. Short on cash, space and time? Turn to Mini Mi! The name says it all! With its clean, sleek appearance and user-friendly controls, this system truly is an easy choice. 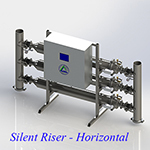 Each system utilizes high efficiency, close coupled end suction pumps with features that make a genuine difference. 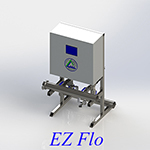 With standard bronze impellers and steep performance curves, EZ Flow achieves greater turndown while maintaining high efficiencies. EZ does it! AMT knows no limits! 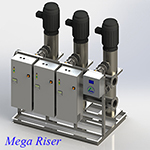 With flows to 10,000 GPM and heads to 1,440 feet, Mega Riser is designed to provide high pressure trouble-free operation for years in even the most demanding applications. With a unique header design, the Mega Riser offers one of the smallest footprints available. Precision balanced bronze impellers provide the highest efficiency and performance possible.